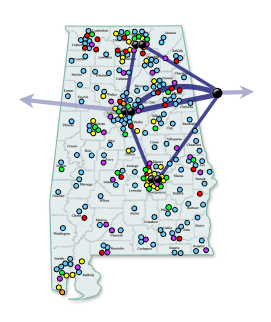 Managed WAN Service provides ASA clients an Internet Protocol (IP) connection between two of their locations (main campus to a remote location, etc.) utilizing dedicated, symmetric, Ethernet access in bandwidth ranges from 10M to 10G. Managed WAN service does not include access to the Internet but the client can allow hosts at the remote location access to their main locations Managed Internet Access Service if so desired. Managed WAN Service includes an ASA managed router at both the main location (connecting to client core router) and remote client location (connecting to remote client LAN). In addition to providing network routing functionality, these routers provides Simple Network Management Protocol (SNMP) data used to monitor the availability and performance of this service. The client must allow the ASA managed router at the remote location access to their main locations Managed Internet Access Service to allow monitoring of ASA’s remote location equipment.